The lack of captions and subtitles on video is a major obstacle for people with hearing disabilities and a huge language barrier for the whole world. Universal Subtitles want to give individuals and communities the power to overcome these barriers. The tools they are building are free and open source and will make the work of subtitling and translating video simpler, more appealing, and, most of all, more collaborative. 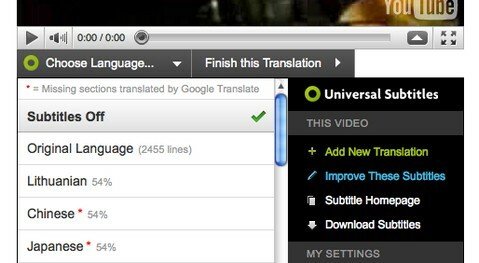 Universal Subtitles make it easy for anyone to add subtitles, captions, or translate nearly any video on the web. You add their widget to your videos. Then you and your viewers can add subtitles, which anyone can watch.